What do we think of Welford Road? A group of a dozen or so gave the cycle lane a tryout before our June meeting . We would have to say that responses were mixed – some of it is good – it’s there, for a start, and it’s segregated, which is what we have campaigned for on these kinds of projects. And there is metered parking along sections of it, which hopefully will mean it doesn’t become a carpark (as Newarke Street does occasionally). Some was not as good as we would have like – no priority at junctions means cyclists have to keep stopping and starting and the ends are not great, but we do know that more will be done at the Welford Place (city) end once the replacement for the New Walk Centre is finished. And there will be some more work done at the other (prison/Tigers) end, once the entrance to the new A&E is completed. So, all in all, a mixed bag. We have arranged a meeting with Adam Clark, Assistant City Mayor for Energy and Sustainability (which includes transport) at which to raise our concerns and identify any improvements that can be made. 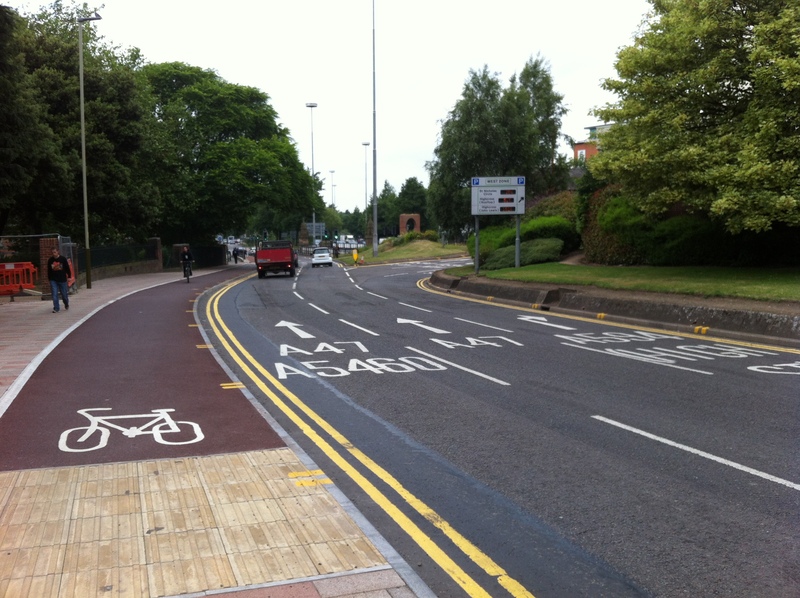 The Leicester Cycle Forum meeting on 27th July discussed the changes on offer for Belgrave Road, from Belgrave Circle to the Loughborough Road turn. In short, the options on the table are as it is (2 lanes in each direction) with a few trees to prettify it and some changes to crossings, or one lane in each direction with bigger pavements (and changed crossings). Neither option offers any safe space for cycling or does anything to reduce the pavement cycling seen as a problem in the area. This is not acceptable and the council needs people to feed into the consultation to make the point that we need separated space to cycle. We are encouraging all our members to complete the consultation as we know that the number of responses on each side is what they care about most. Your response really will count! Here are some suggested responses. Belgrave Road is a major route into the city. At the moment, it is a place where only the fast and the brave will cycle on the road – others choose the pavement, with the usual problems. The Mayor has expressed a desire for cycle tracks on major routes and Leicester has recently been lauded as a forward-thinking city for cycling. 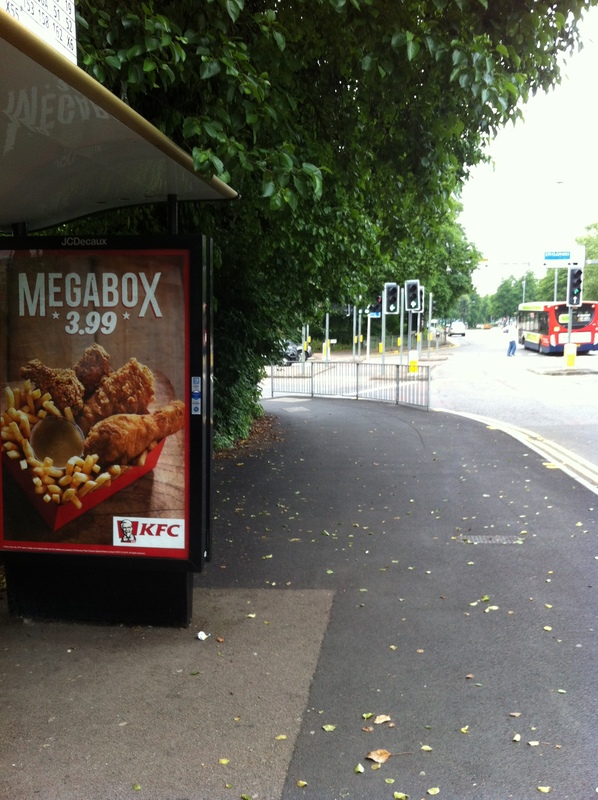 Despite this, there is no separate space for cycling included in these plans. The idea that people will cycle amongst the cars and buses (as shown in the artists impressions) is a whimsical fantasy and cycling levels will continue to be as depressed as they are now. 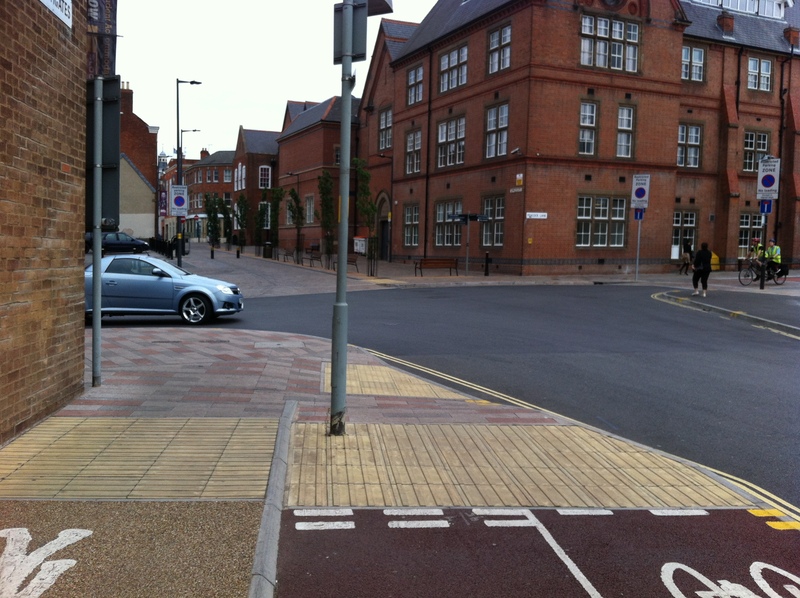 This is contrary to the council’s plans re cycling – would you take children to school on Belgrave Road as pictured? If there is room for four traffic lanes and a central reservation, there is room for two traffic lanes and separated cycle tracks on each side. Questions 3,4,5,6,7 – monitoring questions. We know that numbers count in this consultation. Thanks for you help. There is a piece in the Mercury on the outcome of the Belgrave Consultation. It’s light on detail – in short, the four lane “keep it as it is” option doesn’t have a massive majority. It’s not an ideal situation – we’d have liked a resounding mandate to enable people to cycle safely up and down Belgrave Road. However, not rebuilding four lanes now does leave the door open for something better in the future. LCCG committee member Dave Warnock recently attended a Council consultation event on the Belgrave Road Improvement Scheme. Dave was able to have extensive conversations with a number of staff from the planning consultants Phil Jones Associates, including Phil himself. Dave shared his thoughts with those attending our December meeting and has since produced this detailed comment. You may find it helpful to read this while considering your own response to the consultation (link here), which is open until 15th January 2016. The printed material is available on the consultation website as 3 plans, each with a simple summary of some of the consequences. The Council had also prepared videos showing each of the options in action. Sadly none of the material showed anything much about cycling, no pictures of cyclists anywhere, no details about provision. However, the conversations were much more useful. While there was nothing on display, the team were able to demonstrate that they are planning wider connections for cycling, particularly for crossing the Golden Mile. They plan to introduce infrastructure-free cycling contraflow on all the one-way streets around the Golden Mile. I believe we should offer this a cautious welcome. “Enhanced permeability” (ie. making it easier to get to and from a particular point) is a very good thing. However, on streets with parked cars on both sides, it will take a confident cyclist to ride contraflow with no protection from vehicles. All the options include better crossings of the Golden Mile for cyclists, making East/West movement much easier and faster. This should be welcomed. There are a small number of other connections they hope to make in all the options, particularly from Belgrave Circle past the Gandhi statue to the Cossington Recreation Ground. Again this is good news. All the options claim to provide opportunity for new cycle parking. However, there is no detail about location, numbers or style. Good quality, secure, convenient cycle parking right along the Golden Mile would be a significant improvement. A few Sheffield stands dotted at random will not be. This option is very similar to what is there today. 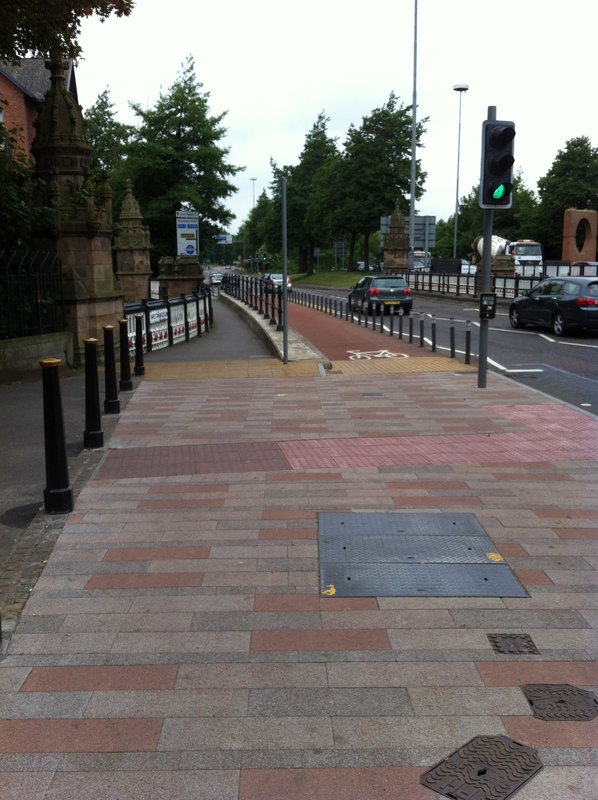 It provides no cycle infrastructure along the Golden Mile and no significant improvements for pedestrians. I do not believe we should consider supporting this option which offers no improvements at all for cycle journeys along the Golden Mile. The video and presentations ignore the current reality of illegal parking which means that one lane always has multiple blockages in it due to illegally parked vehicles. So the theoretical traffic flows are never achieved. These options actually differ very little for cycling. An argument for option 2 (with full length central reservation) is that there is still space for good cycling infrastructure while also making it easier for pedestrians to cross the road. It does seem to me that one of the key advantages of the central reservation is that it stops people simply parking anywhere along the road as they would completely block all traffic. Of course, unless something is done to stop it they will simply park on the footway (or cycle track). From a Cycling Campaign viewpoint, the problem is that the plans show so little about cycle infrastructure that essentially we are being asked to simply trust Phil Jones Associates and the Council to actually design and implement something that works. Sadly the videos were extremely unhelpful in encouraging that trust. 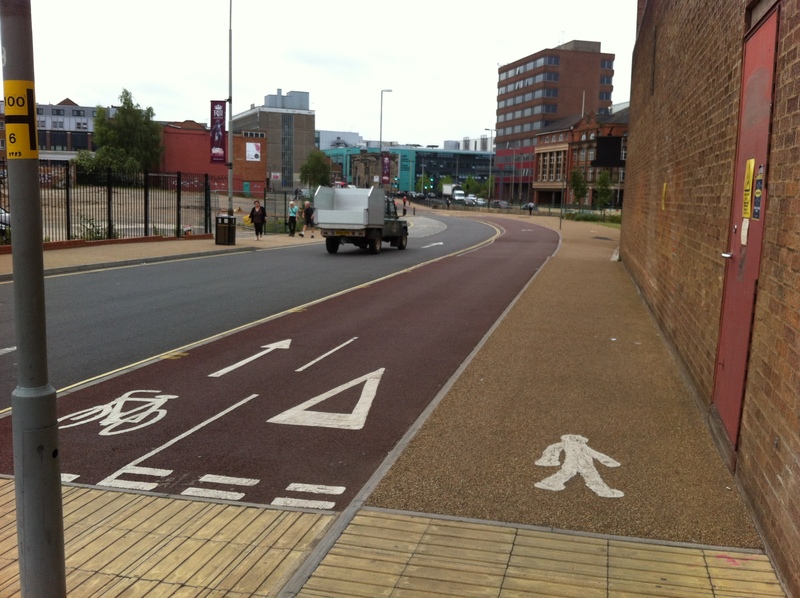 They showed only an advisory cycle lane (dashed painted line). They didn’t include a single bike and they showed vehicles driving in the cycle lane. They also failed to show any safe junctions for cycling. I am assured that Phil Jones Associates believe that in both options there is space for a full separated cycle lane in each direction that would be at least 1.8m wide (and hopefully even over 2m – which is the recommended minimum after all). They appear to be committed to providing this even though they have not shown it on the designs so far (apparently the difference between a painted line and fully separated infrastructure is a “detail”). I am also assured that the detailed design will include safe junctions for cyclists. 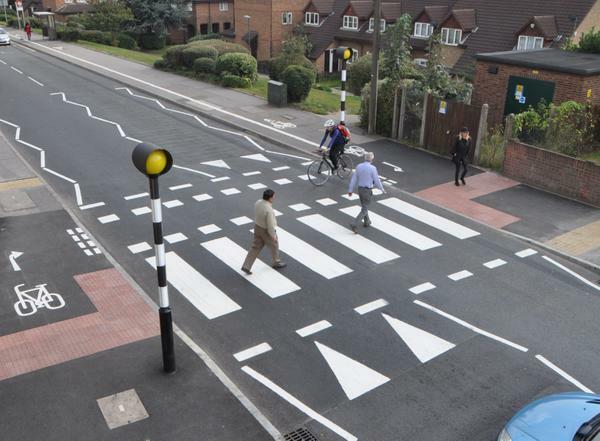 These are likely to be slower than simply ‘taking the lane’, as they will include some diversions to use zebra crossings (the new sort with a parallel crossing for cycles). However, I think this is the right approach for junctions such as these, as it can take away one of the most significant dangers which is left-turning vehicles. One example will be when heading north to get past the Loughborough Road turning. Therefore we should support these as the right way to open up cycling to the full range of potential users. A painted line (mandatory or advisory) will not be considered acceptable by the Cycling Campaign Group. We would expect to find it frequently blocked by parked vehicles and it offers no protection at junctions. It would do nothing to encourage people to choose to cycle. A hybrid cycleway (½ step kerb up from the road and another ½ step kerb up to the footway) is attractive, provided vehicles are prevented from parking on it. Without protection from parked vehicles it is no use at all, especially on a street where so many drivers already park illegally. We all agreed that any cycleway needs to be properly separated not just from vehicles but also from pedestrians. That needs to be more than just a painted line in order for it to work for people with visual difficulties and for guide-dogs. Together we wondered about meeting the concerns of shop keepers wanting to be protected from ram-raiding as well as keeping the cycleway clear of vehicles and providing cycle parking by putting barriers between the cycle way and the road that could also be used for bike parking. At its simplest, this would be a line of Sheffield stands between the cycleway and the road (although they were thinking of a more “stylish” alternative). I felt this would be an excellent option as not only would it protect the cycleway and provide lots of bike parking it would also keep the footway clear of bike parking. I recommend responding to the consultation by rejecting option 1 and by supporting either option 2 or 3 providing that the detailed design includes safe, separated cycleways along the full length of the Golden Mile that are clearly separated from pedestrians (by level, colour and surface) and which are protected from vehicles parking in them through kerbs, wands, posts, Sheffield stands or some such means. The cycleways must provide safe and convenient crossings of all junctions. I also recommend supporting the increased permeability and wider cycle network connections while pointing out that without separated infrastructure these are likely to be of limited benefit in encouraging people who do not currently cycle to choose to do so. As part of the Waterside development, proposals have been made for changes to the use of Soar Lane, which currently forms part of National Cycle Network Route 6. We consider the changes will make this section less safe for cyclists and have submitted a comment to the Council in relation to the planning application. You can access the application documents on the Planning Department’s webpages and it would appear that you may still be able to comment, although the ‘publicity period’ has ended. Below you will find the text of a letter put together by LCCG members in response to the proposals, in case you would like to submit your own comments. 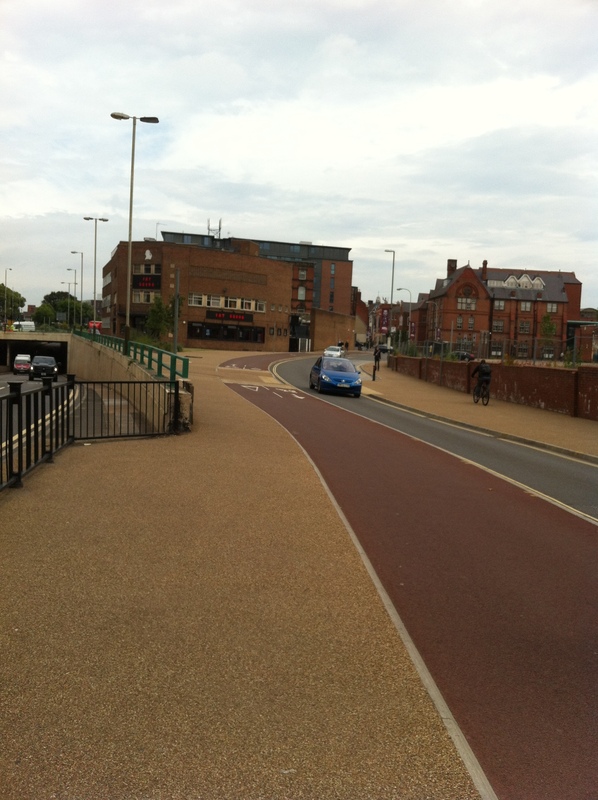 “I am writing on behalf of Leicester Cycling Campaign Group about planning application 20151587, the outline application for Phase 1 of the Waterside redevelopment. “There are many aspects of this plan, and the wider Waterside regeneration proposals, that we welcome. These include new cycle/pedestrian routes along the water’s edge, and the provision of cycle parking throughout the project area. Given its proximity to the city centre, we feel the Waterside represents a great opportunity for a mixed development where a significant number of journeys are made by cycle, on foot, and by public transport. “However, we are concerned about the proposals regarding Soar Lane. The report and its transport assessment recognise that Soar Lane forms part of National Cycle Route 6. The location of the river and canal mean it is one of the few places where cyclists can make east-west journeys. Soar Lane has relatively little motor traffic at present, partly because the area is economically depressed, and partly because the road is one-way from the A50 Northgates junction. Naturally the success of Waterside would increase traffic flows, as would (we believe) making the road two-way along its entire length. The traffic assessment predicts an increase in traffic at the Soar Lane-Jarvis Street junction of 33-48 per cent – without altering the one-way section. I’ve been looking at cycling infrastructure in Leicester closely recently, especially as I prepare a ride to show it to visitors on Saturday. The theme of the ride keeps coming back to: “This is great…GAH I nearly died!” Here are some photos that demonstrate some problems. As campaigners we always say that if one piece of the route doesn’t work, the whole route doesn’t work. 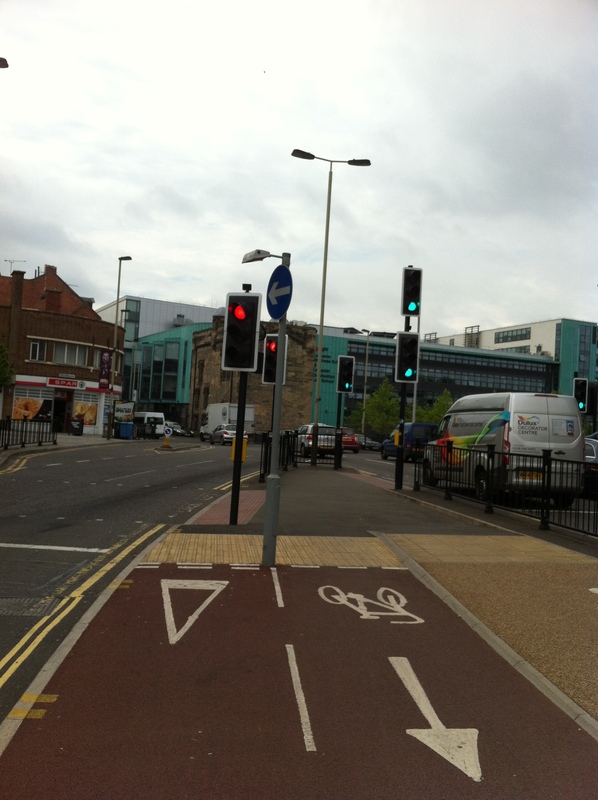 Often that is at a junction, and these are very good examples. The first photos are a lovely stretch of Southgates. Until, at the top end the kerb cuts are placed to dump you into crossing motor traffic; neither of you can see and the priority feels unclear while riding. On the bottom end there is a badly, badly placed pole holding a sign for drivers, besides all the other clutter. The second photos are beautiful bits of St Nicholas Circle. Beautiful right up until a blind corner sweeps you into unsuspecting pedestrians and a sharp turn to a crossing. We fought this design for the crossing, and now that it’s been built, it’s clear why we wanted it changed. For concept, 10 out of 10; for execution…if one part fails, it all fails. This is why we keep at it, keep celebrating the vision, and keep working to insist the details match that vision. 20th May – Plans were presented at the Cycle City Workshop by a member of the design team. LCCG representatives (and others) were not at all pleased with the reduction in provision being proposed. Works are due to start on the north side (existing lane) in early June, as evidenced by signs already up. We have written to the city Mayor outlining our concerns in relation to the changes to the plans consulted on earlier, as well as our disappointment with the consultation process, and await his reply. Leicester Cycling Campaign Group are very aware that, thanks to the city Mayor, Leicester is moving in the right direction with regards to giving people choices in how they travel. We sometimes go into the county, are reminded what cycle provision was like 20 years ago and are glad to be back on something half-useful in the city. We have some segregated contraflows (Berridge Street, Greyfriars), segregated tracks (Southgates, Newarke St) and a fully pedestrianised town centre. There have been sub-standard bits (north of Belgrave Circle) but we are encouraged by movement on London Road and Welford Road, both major routes into and out of the city. We have a forum chaired by Sir Peter Soulsby, the city Mayor, specifically to discuss cycle infrastructure with him and the planners. We have also raised issues with the way consultation and communication has been handled with other projects, and have been promised greater openness and transparency from the planning department. In light of all this, recent events around the A50 Groby Road have been extremely disappointing. Details of the consultation on improvements between the New Parks Blvd roundabout by the Glenfield Hospital and the junction with Blackbird Road approaching the inner ring road are available on the Council’s website. Plans at that stage included a dedicated, segregated cycle lane on either side of the road, all the way out to the roundabout at Station Road / Gynsill Lane beyond County Hall (as in the attached drawing, still showing on the website). We responded to the consultation in November 2014 pointing out (amongst other things), the lack of width at 1.5m and the lack of priority at side roads. The council facilitated a meeting on 3rd December with the project engineer to discuss this project, which was very positive. Plans were circulated in December which lacked any junction treatments beyond the occasional toucan but did have tracks on both sides of the A50. Our previous comments stand. Deadly quiet reigned for 3 months. A cycle city workshop meeting arranged a meeting with the planners for 1st April but this didn’t make it into the minutes. Or anybody at the council’s diaries – the key people were on holiday so it didn’t happen. 15th April, cycle city workshop – meeting planned for 21st April. 21st April – meeting cancelled on the day because the design team couldn’t make it. Discussion moved to the Cycle City Workshop scheduled for 20th May. Aware that time was ticking by, we asked for an earlier meeting with the project manager and hoped that we would at least get a chance to see the plans in advance of the CCW. We’re told that there were no convenient dates available for a pre-meeting and that there were delays with the plans.